There are views after views. Enna, the highest capital in Europe, will enchant you thanks to the beauty of the nature that surrounds it. The most seductive place is Rocca di Cerere, from where it seems possible to hear the hymns dedicated to Mother Earth and sung by her priestesses. The magnificence of its landscape is so great that it stands out over the iridescent corn fields, changing from the soft colours of the rising sun to the intensity of the sunset, depending on the season and the hour of the day. The city, maybe for its high and lonely position, is permeated with a natural religiosity deeply connected to the goddess of the harvest. Over the centuries, Enna has kept this vocation and has devoted itself to her patron Saint, Our Lady of the Visitation. It was built in 1307 at the behest of Queen Eleanor of Anjou, then rebuilt and embellished later on. Once a national monument and since 2008 Place of Peace UNESCO, it is surrounded by a monumental staircase. Its interior, with three naves, has a splendid wooden coffered roof , decorated by Andrea Russo Collesano. The wooden choirs placed on either side of the triumphal arch were made by Scipione di Guido. The central apse is completely covered with Baroque stuccoes by Pietro Rosso from Bologna, in its frames, five large canvas by Filippo Paladini. The lefts side apse is dedicated to the Blessed Sacrament; it shows an old Gothic style with ribbed vaults. The right side apse is dedicated to the Madonna of the Visitation and is richly covered with multicoloured marble in baroque design, the work of Andrea Amato. In the enclosed alcove, closed by an icon door, we find the processional statue of the patron saint , the work of the Venetian workshop (1474). The sacristy is full of valuable works such as the wooden casserizio (piece of furniture) featuring scenes from the life of Jesus or the white marmoreal washstand of 1648. The floor is in Sicilian majolica tiles with scenes of the New Testament. In the square in front of the church the Varisano Archaeological Museum exhibits items coming from the archaeological sites near the city. The exhibition follows the logical thread of the Archaeological Research from prehistory to the Middle Ages and shows Enna as the city of Demeter and Kore as reported by many ancient sources. 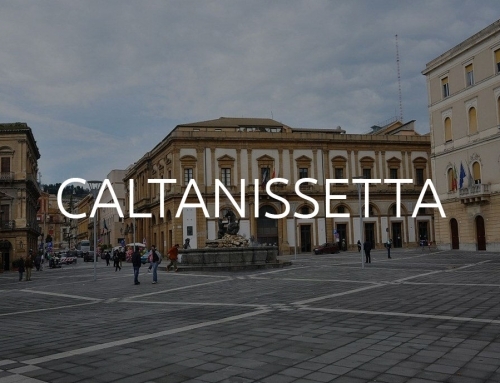 If you are in Enna on 2nd July, on the occasion of the Madonna della Visitazione procession, we are sure that you will wake up at 7 am at the sound of the 101 gunfire in honour of the patron saint of the city. The statue of the Madonna, which during the year is kept in its multicoloured marble niche inside the Cathedral, is carried in procession along the town. It is entirely covered with gold and precious stones and is kept inside a large sixteenth century “Vara” (reliquary casket) called Nave d’oro, carried on the shoulders of 118 barefoot confreres, gli ignudi (naked ones). 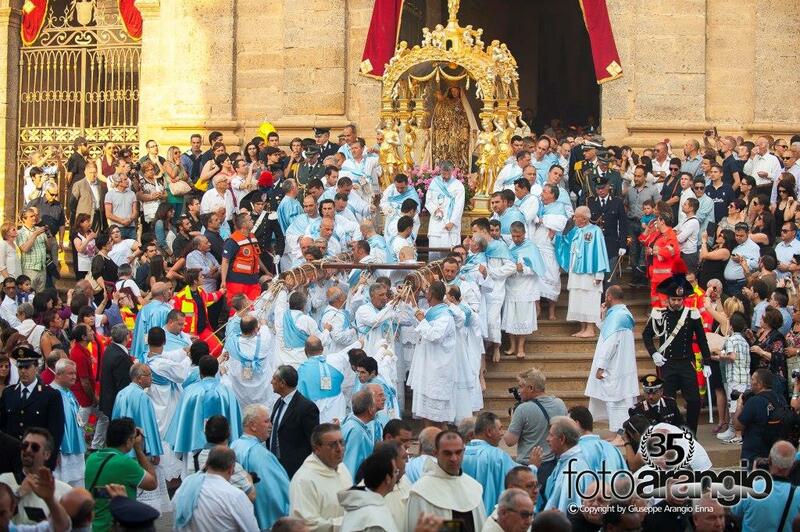 The procession starts in the cathedral and along the way there is the firing called the sarbiate, a gun salute. Near the hermitage of Montesalvo, the statues of St. Zachary and St. Elizabeth, which will meet the Madonna, come out from the church. Immediately after the entry into the Church of the Madonna, the artistic fireworks start. 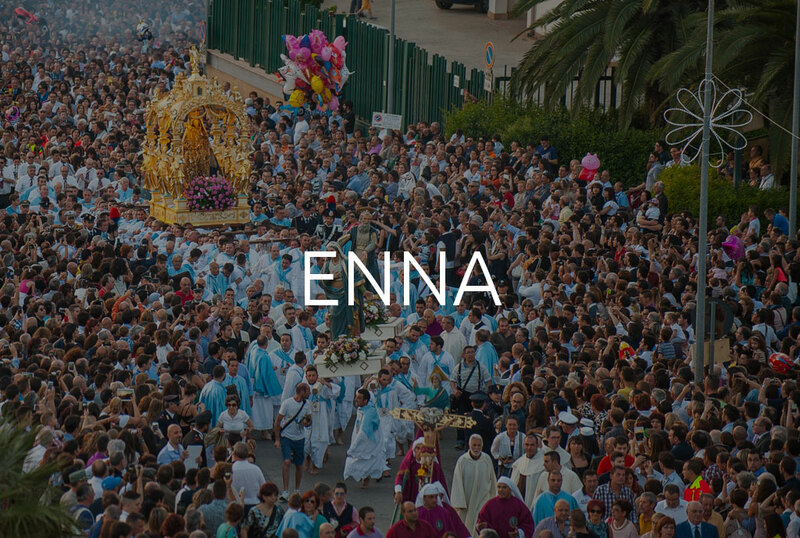 Here, you’ll see the explosions of joy that characterise all the religious celebrations in Sicily. The symbol of the town, it is one of the largest medieval castles in Italy. Built atop the ruins of the ancient acropolis and the Byzantine, Arabic and Norman fortifications, it is divided into three large courtyards and a ravelin (triangular fortress). These can work as separate castles and are equipped with several towers and structures for the military presence and the residence of the court. The damaged Swabian palace, the palatium, was not rebuilt, and a portion of it became a tall thirteenth century tower called Pisana Tower. From here, the ancient lookouts could control most of Sicily and, on clear days, they could see the sea. At the foot of the Castle, is the statue of Euno, a Syrian slave who, in 132 BC, began the First Servile War.. The Tower of Federico, surrounded by the homonymous city park, is a castle-like medieval building. It consists of the ruins of a vast walled octagonal area opened up to two arched doors at the centre where there is a tall tower, which is also octagonal. The tower inside has Swabian architectural features that trace the construction back to the Kingdom of Frederick II of Swabia. Not far from, one of the gates of Enna: the Monumental Gate of Janniscuru, a robust walled remnant, placed to interrupt the road entrenchment. Encircled by verdant hills, it allows the collection of the waters despite not having real tributaries. 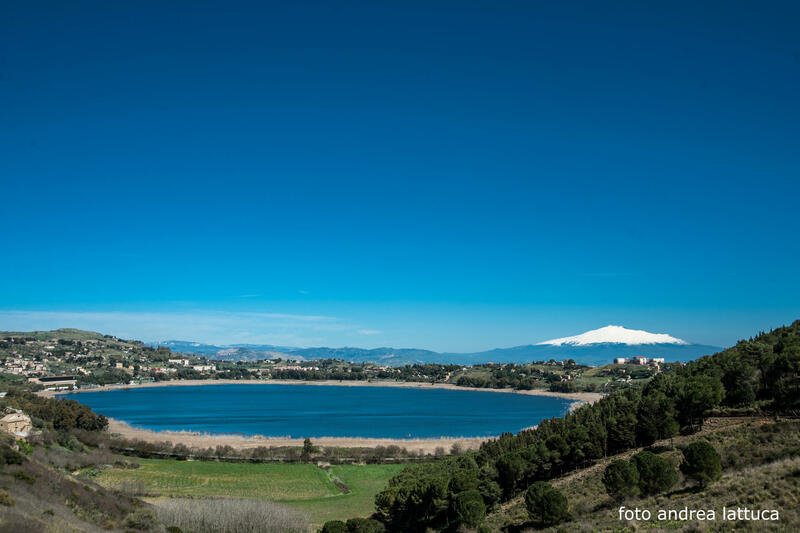 The salty water is collected in the centre of the basin, and this gives the Pergusa environment a great natural importance. It’s an environment full of biodiversity and cultural and mythological features. Lake Pergusa, a natural lake in the Sicilian hinterland, is a key area in the migration of many species of birds, because it’s situated along one of the main migratory routes of the Western Palaearctic. It’s an ideal resting place for thousands of aquatic birds in transit to Africa. Bird watchers can easily spot the teal, the wigeon, the shoveler, the pochard, the coot, the marsh harrier and the ferruginous duck. Among the mammals that stroll around here are porcupines and weasels, reptiles and amphibians such as marsh turtles. The Church of San Marco with the adjacent cloistered convent of Discalced Carmelites, dates back to the first half of the sixteenth century and was built on the ruins of a synagogue which marked the border the Jewish ghetto, still known as Iudeca, the name given to this area. In its interior, sumptuous stucco contrast with the strict linearity of the facade with a single nave in Baroque style. It’s topped by a vaulted ceiling with lunettes and without transept to allow the nuns to attend, without infringing the obligation of enclosure, to the solemn functions in the choir loft. This is located in the vestibule; its railing is full of dense fretwork that follow the lively “petto d’oca” (curved balusters) style and finishes with a cornice of artistic carvings, in a superb wooden lace. In this baroque architecture, you can admire the stucco work and the frescoes of Gabriele De Blanc (1705). The most striking work is the great wooden tabernacle occupying the main altar, the work of Antonino Rallo, designed by the architect Daidone da Calascibetta (1708), covered in pure gold leaf. The façade has slightly protruding decorative features such as the two pilasters resting on high plinths framing it, topped with Corinthian capitals, flanked by two simple volutes and the central window surmounted by an elegant crowning element. 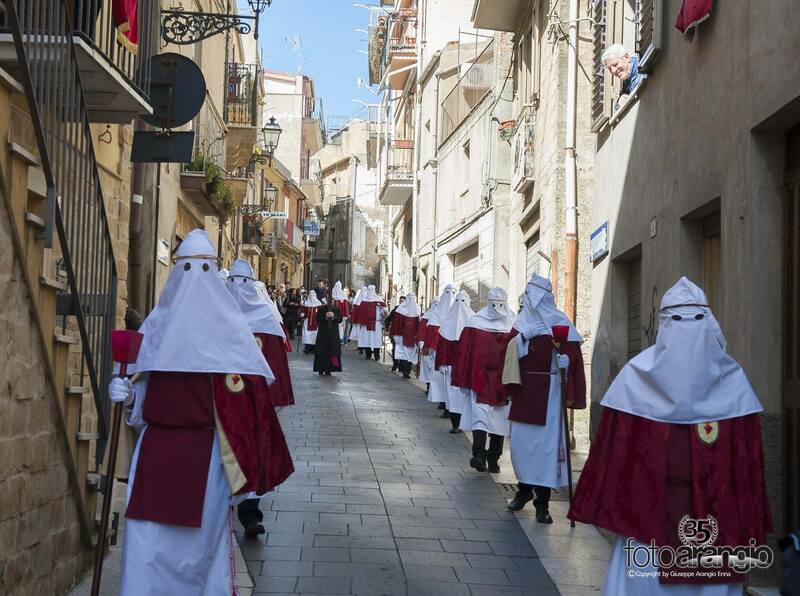 Nearly 2500 brethrens, in a quiet and composed procession, involve the whole city. In the silence of citizens and traffic you can only hear the mournful notes of the band and the buzz of people who attend the passage of the brethrens with the banners of Our Lady of Sorrows‘ and the Dead Christ‘s Reliquary Confraternities . On Good Friday afternoon everything stands still: at 04:00 pm the brotherhoods start the path that runs through the village. “La Paesana” (the fog, so called by the citizens of Enna) makes the atmosphere even more solemn. As an open-air museum, the site includes two abandoned sulphur mines carrying the same name. It’s a typical example of the settlements of industrial archaeology of southern Italy and offers the opportunity to discover the techniques of extracting and melting sulphur over various periods. Here you can see the calcaroni (circular melting ovens), the shafts (semi-vertical burrows), the frames and systems of vertical wells, the Gil ovens (very modern system for melting sulphur). The fascinating Pennisi Palace, the former residence of the owner’s family, dominates the Floristella mining complex. With its works for collecting water it is a artefact of considerable historical and architectural interest. The city of Piazza Armerina surrounded by green woods that frame it, with its medieval layout is famous for its historical and archaeological heritage. 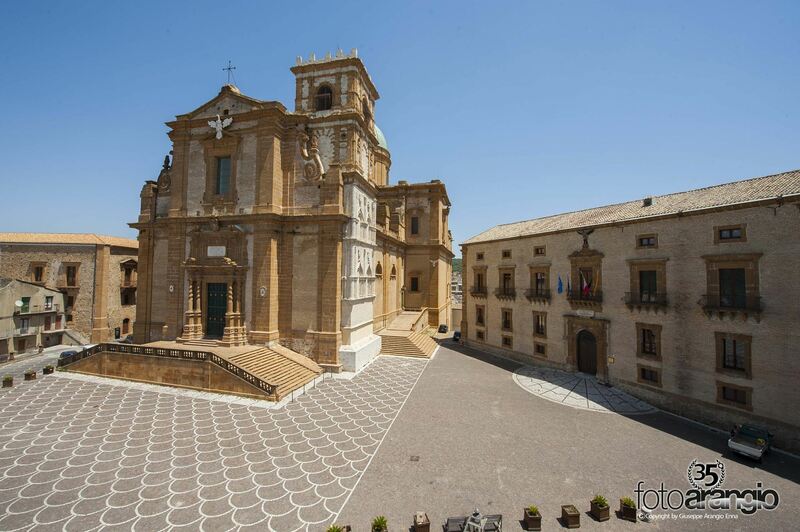 Its valuable artistic flair can also be found in its many religious buildings, particularly the Gran Priorato di Sant’Andrea (Grand Priory of Saint Andrew), the oldest church in Piazza Armerina, one of the most interesting works of the Sicilian middle ages. But it’s in the Church of San Giovanni, in the beauty of Borremans’ paintings and frescoes, whose ancestral splendor has been recently restored , that you can appreciate the city’s highest artistic expression. Strolling around the town, up one narrow street and down another, you can still look at some undoubtedly valuable building from the Baroque and Renaissance age. 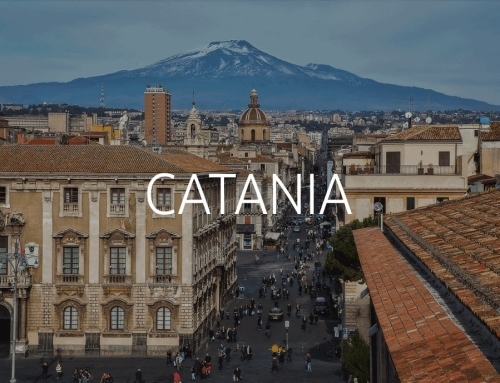 Reaching Piazza Duomo (Cathedral Square) you get to the highest and oldest heart of the city, where you can admire the Cathedral, overlooking the square with its imposing dome, and Palazzo Trigona, a majestic palace built on the willing of the same Family. A short walk from there, the Pinacoteca comunale (town’s Art Museum) and other museums that certainly won’t let down those who’ll take a walk through the historical center, tasting, meanwhile, the food specialties and the local patisserie. 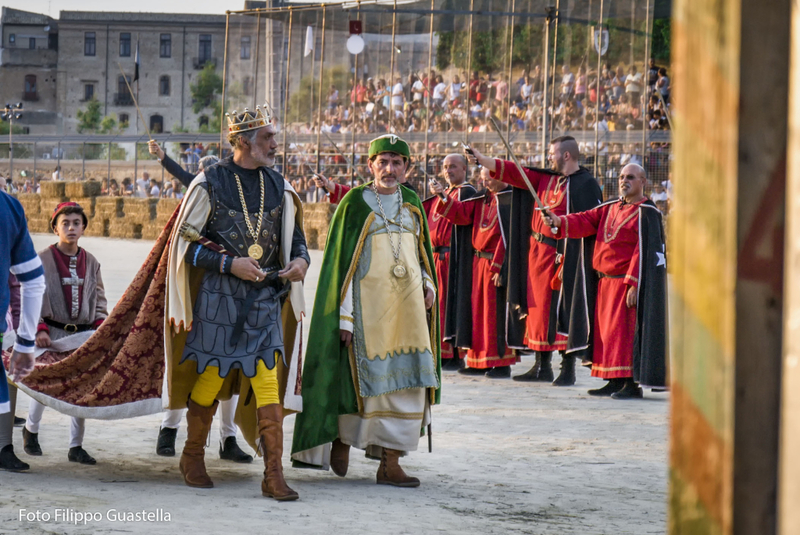 Every year, from 12 to 14 August, the Palio dei Normanni, takes place in Piazza Armerina. It recalls the Norman militias’ entrance in the ancient city of Plutia, for taking the Christians off the yoke of the Saracens. This event takes place during 3 days and involves about 600 figurants: Ladies, dignitaries, knights and Norman soldiers led by Count Ruggero the Norman, every one wearing medieval costumes and parading throughout the city streets. 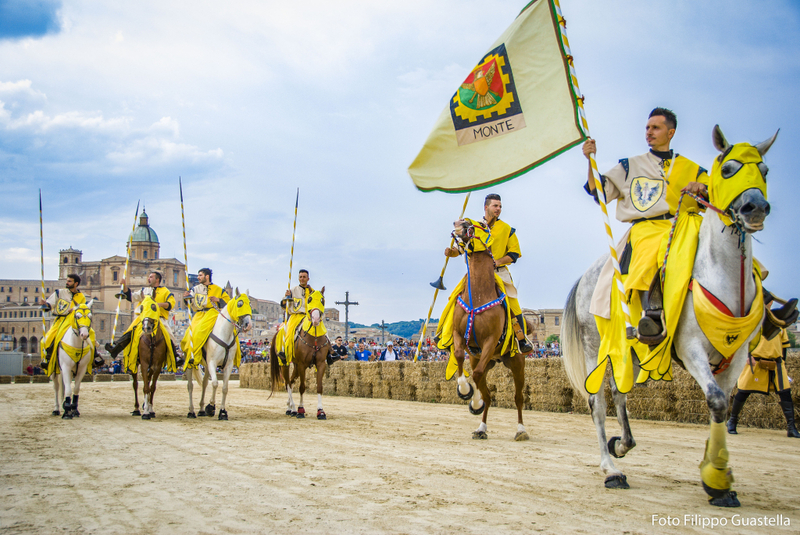 The highlight of the event is the Quintana, the exciting horse ride where the 4 city districts compete for winning the Palio. Going through the many rooms and the long corridors of Villa Romana del Casale amounts to being transported to ancient Rome. The villa, listed in the UNESCO World Heritage Sites, is a work of monumental importance both for its size and its historical value. 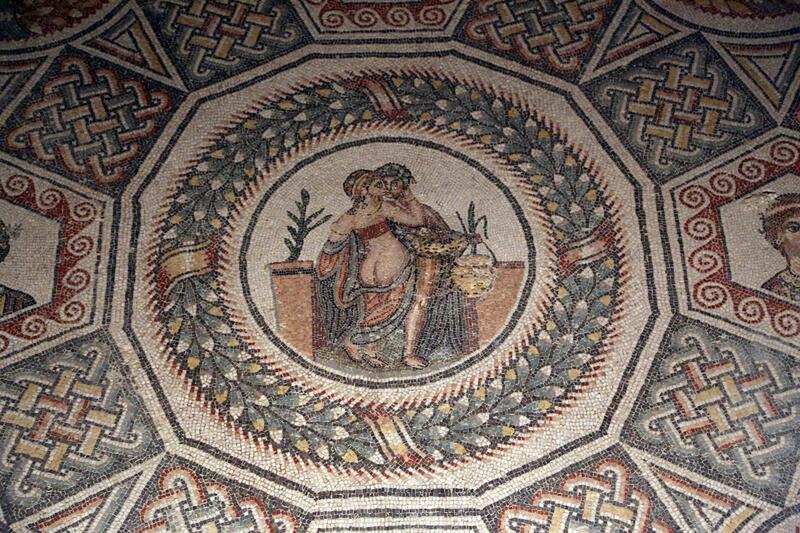 Its elegant mosaics, adorning more than a 3500 square meters floors, attract people from all over the world. They suggest us what life was like at the end of III A.D. We recommend visiting the site with the assistance of an authorized guide. 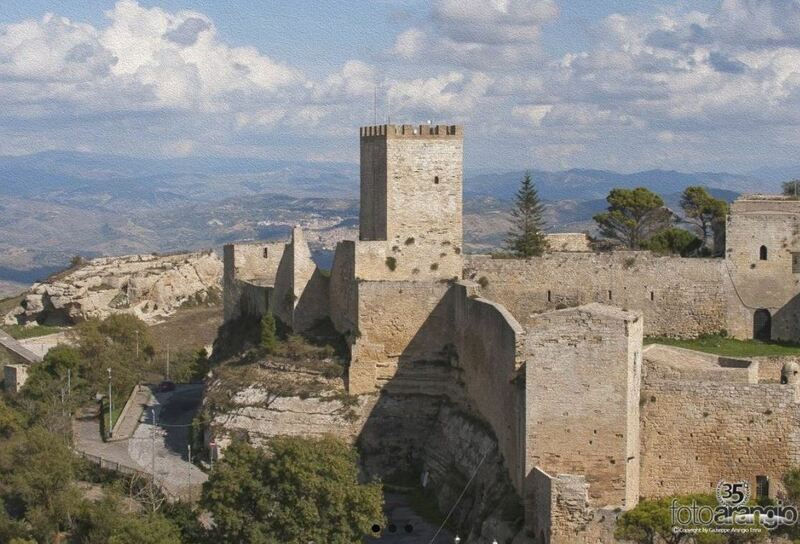 Walking through the narrow streets of Aidone, among palaces and churches, we arrive at the highest point of the village where we find the ruins of a mighty fortress built by the Arabs as an outpost and observation point. It was fortified and transformed into a castle. 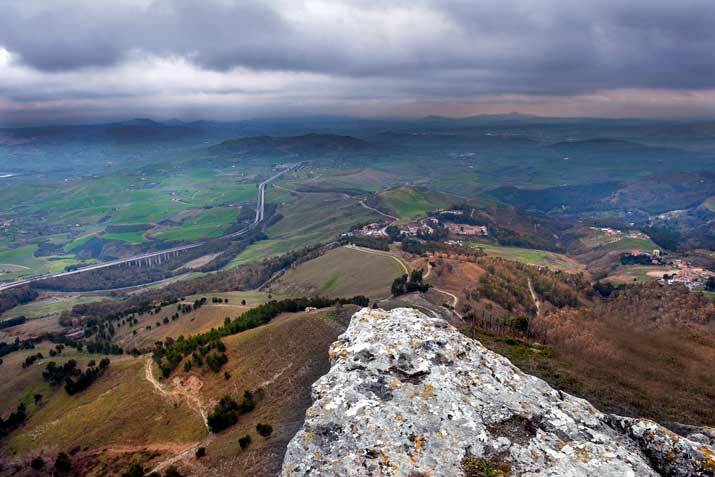 Nowadays the remains of the Castellaccio are a shapeless heap of ruins surrounded by a beautiful view of the valley. Going down the Via Roma, the Church of St. Dominic or St. Vincent Ferrer, with the characteristic facade in diamond-cut ashlar (XV sec), and the Church of St. Anne dating back to seventeenth century and keeping a wooden crucifix ascribed to Friar Humble from Petralia. If you are here during the month of May, you can be present at the renowned pilgrimage and to the Festival of St. Philip the Apostle. The night before May 1, hundreds of people gather to worship the black saint, St. Filippo. The pilgrimage concludes in the Church of Santa Maria La Cava, in Cordova Square, dominated by the Adelasia Tower dating back to the Norman period. 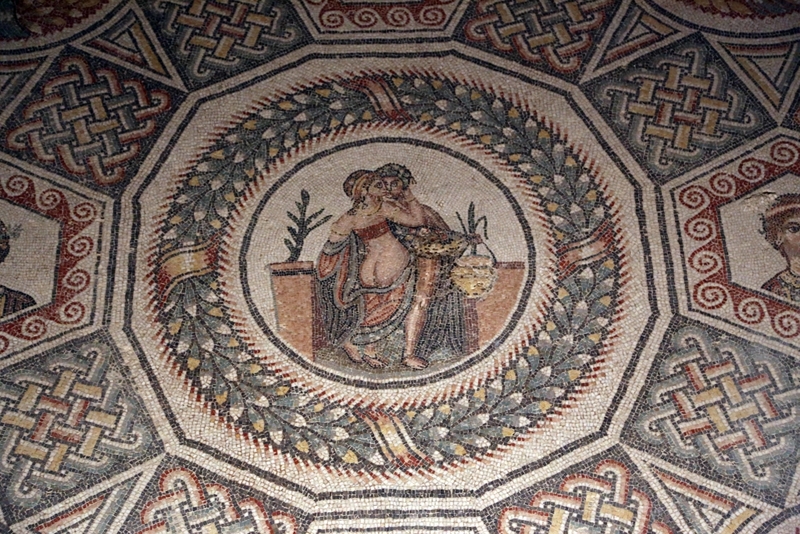 The Archaeological Museum is inside the former Capuchin monastery (XVII century). The Church of San Francesco, annexe to the building, is equipped as museum auditorium. 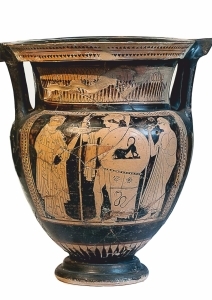 In the halls of the museum of ceramics, we find pottery in the shape of horn, stone and bone tools, vases of Morgeti, the founders of Morgantina, evidence of the Hellenic presence in the site. 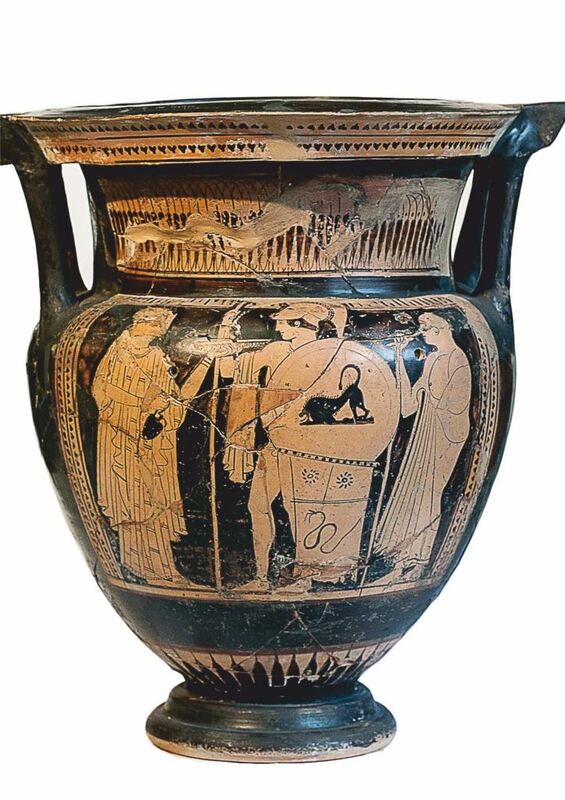 In the hall Serra Orlando we find the Persephone busts and votive offerings of a culture that worshiped Demeter, Persephone, Aphrodite, Hermes. Of enormous value, not only for the metal, the Morgantina silver, the metopes and the statue of the Goddess to which an entire room is dedicated. Carved between 425 BC and 400 B.C. the statue has suffered many vicissitudes: in the early ‘ 80s it arrived in Switzerland and was later purchased by J. P. Getty Museum in Malibu. Point of contention at great length and widely admired by the Paul Getty Museum it is now back in its place of belonging. The statue of the Goddess is 2.24 meters high, and her body is presented very harmoniously and clearly beneath the drapery. The naked parts of the body – the face and arms – are made of white marble from Paros Island. Particularly interesting the wet effect of the garment on the torso, highlighting the contours of the body, and the rich drapery forming large folds. Researchers recognize in this statue, also known as the Goddess of Morgantina, the depiction of Demeter and Kore. And now…the amazing Head of Hades or Bluebeard. 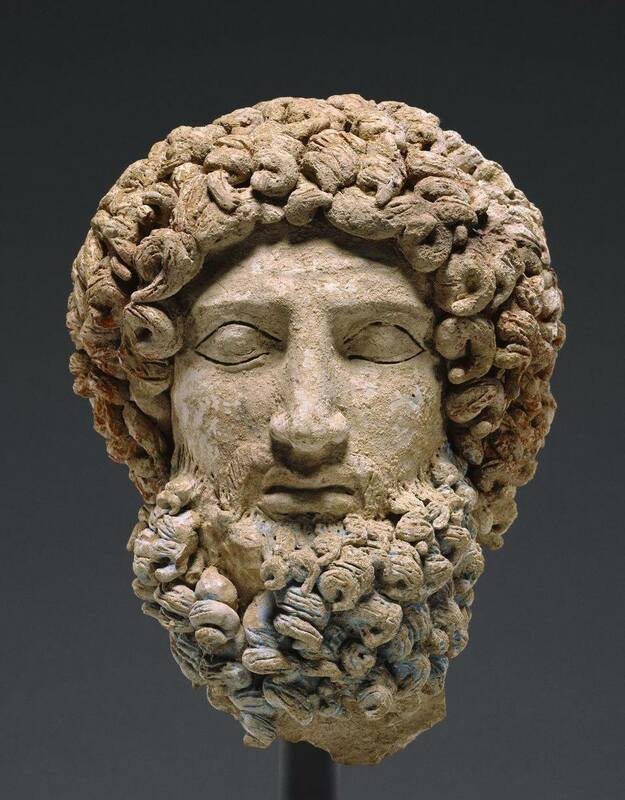 It’s a polychrome terracotta head from the Hellenistic period, depicting probably the greek god of the underworld Hades and coming from the archeologica Park of San Francesco Bisconti Morgantina. The archaeological site of Morgantina is what has come to light from the ancient Sicilian and Greek city in the territory of Aidone. The city was brought to light in the autumn of 1955 by the archaeological mission of the University of Princeton (United States). The excavations allow us to follow the development of the settlement for a period of about a thousand years, from prehistoric to Roman times. The area most easily visited preserves ruins from the middle of the fifth century to the end of the first century B.C., the period of maximum splendour of the city. The excavations have revealed the Agora, the Theatre and the entire town with residential neighbourhoods, with the paved road and the furnaces for the production of ceramics. 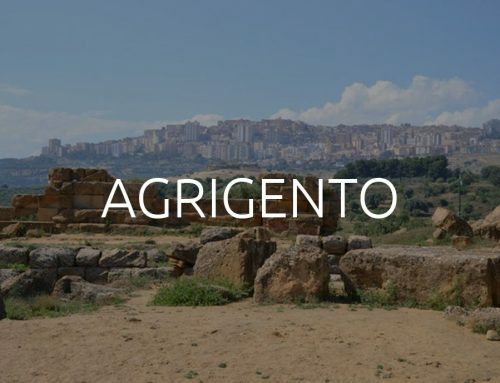 On early August you can enjoy the Festival Morgantina Rivive organized by Aidone Archeo-Club. 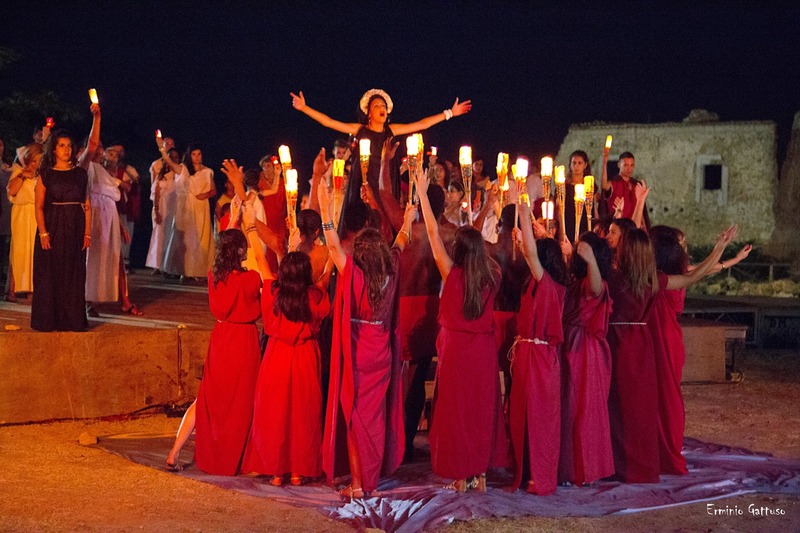 The most important places of the city re-experience the civic life of the polis and its most significant activities through a re-enactment including classic pieces, rituals and local myths, with a specific annual theme. 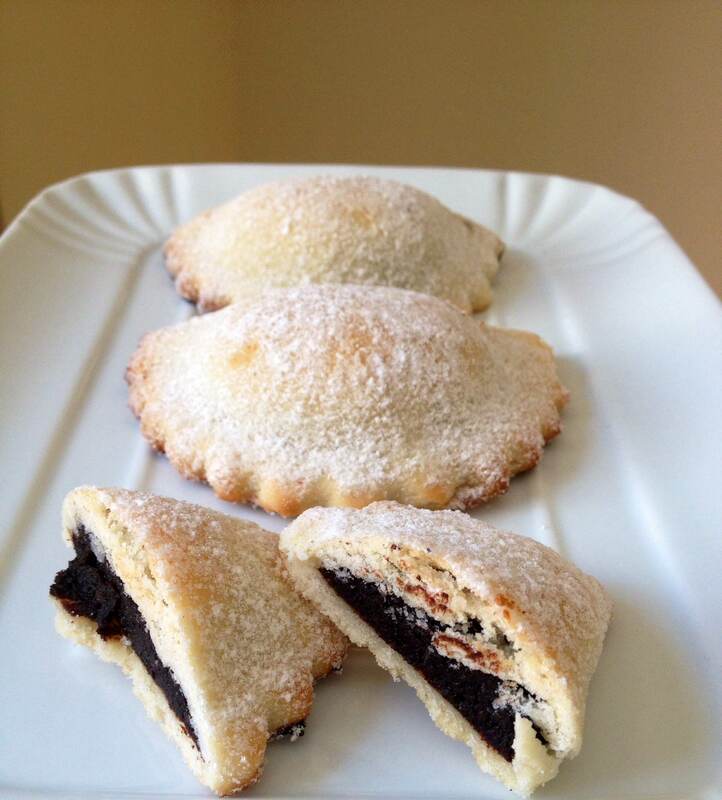 Among the typical products, do not miss the cicerchia, a typical legumes used for both sweet or savory dishes.